The President of the National Farmers Union (NFU) has leant his support to a Midlands children’s school farm that is under threat from the current crisis in the dairy industry. NFU President, Meurig Raymond, was clearly impressed as he toured the dairy unit at Mount Pleasant School Farm at Forhill on the outskirts of Birmingham. He was struck by the detrimental effect the dairy crisis is having on the charity-run children’s education centre. 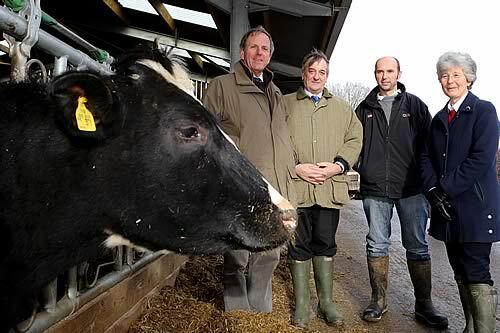 NFU President Meurig Raymond, (second left); during his visit to Mount Pleasant School Farm near Birmingham with L-R: Julian Salmon, Worgan Trust; Peter Charles, farmer; and Candia Compton, Worgan Trust. Mount Pleasant School Farm provides a unique opportunity to give city children an insight into food, farming and the countryside, and is one of the few dairy farms remaining so close to Birmingham. It is owned and run by The Worgan Trust which was set up by the Cadbury family in the 1960s as a means of teaching inner city children about farming, food and the countryside, since then more than 400,000 children have enjoyed and benefitted from the experience. As he toured the site Mr Raymond discussed the dairy crisis with Mount Pleasant’s tenant farmers Peter and Emma Charles, and learnt of its knock-on effect on the school farm. Mr Raymond promised to take Mount Pleasant’s message to the highest level and to stress the importance of the dairy farm, the classroom and the educational value. “Mount Pleasant does not work without it (the dairy farm) it’s so important, it is education at its best, “ he said. However, while the dairy industry is in dire straits he reassured Peter and Emma that the situation will eventually improve. In addition to the working dairy farm the centre also includes a £500,000 purpose-built classroom, where teaching focuses on the new curriculum Key Stage One and Two Design and Technology element – understanding where food comes from. Worgan trustee Julian Salmon asked Mr Raymond to take the message of Mount Pleasant’s crisis back to the highest level in his capacity as NFU President. “Dairy farming has been at the heart of this unique educational experience enjoyed by Birmingham's inner city children for over 40 years. It has also been at the heart of Britain's agriculture and unique pastoral landscape for Millennia. “Using milk as a weapon in price wars puts at risk what could be the only chance for future generations of Birmingham's children to learn first hand about the countryside and farming in this classroom environment.